One of the better freeware RPGs with a quality that rivals commercial releases, Avalon is an RPG in the classic anime "SD" (stumpy head) style, although it resembles Western comics more than Japanese anime. A village in the far future is under attack by monsters, and you the only one who is brave enough to save it. Naturally, this is not an easy task, as you'll have to fight many powerful creatures and solve puzzles to find the missing human leaders and a way to get rid of the monsters, once and for all. Although the graphics are outdated by today's standards, the game has a wonderful story and many different weapons and armor to choose from, such as swords, axes, bows, and guns, to name just a few. 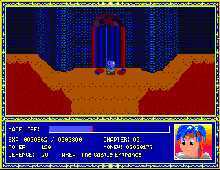 Gameplay and interface resemble most console RPGs, or at least console-inspired RPGs such as The Ancient Land of Ys. The characters you meet along your adventure provide you with both informative and realistic dialog that is vital to the success of your mission. Similar to most console RPGs, battles are strategic: once a monster attacks you, a screen pops up asking whether you'd like to attack, use an item, check your status, or just run away. Your character becomes stronger as he gains experience from killing monsters. With pleasant graphics, good storyline, and many NPCs, items, and monsters, Avalon is easily one of the most underrated freeware RPGs ever made. Highly recommended, especially to casual players who enjoy console RPGs. Thumbs up!